The Classic Manhattan Cocktail is an old school cocktail that never goes out of style. The blend of whiskey, vermouth, and bitters is easy to make and easy to drink! Click here to pin this Classic Manhattan now! What is a Classic Manhattan Cocktail? While cocktails grow fancier and more complicated by the day – Bourbon with Orange-Thyme Syrup and Roasted Cherry Splash. I made that up, but you get what I’m taking about! Sometimes I want fancy and sometimes I want to get back into my rat pack groove and sip a classic. This time it was a Manhattan. The history of the Manhattan is kind of murky. It shows up as early as the 1860’s. According to Wikipedia:A Manhattan is a cocktail made with whiskey, sweet vermouth, and bitters. Commonly used whiskeys include rye (the traditional choice), Canadian whiskey, bourbon, blended whiskey and Tennessee Whiskey. Even though the Manhattan is a classic just the way it is, it’s approach can be easily varied. Some stir, some shake. Some use rye and some use bourbon or Canadian Whisky. You can also change up the bitters, using your own homemade bitters (which I am planning on trying), add some maraschino cherry juice, or even switch out the vermouth. A Perfect Manhattan is an easy variation – instead of using one vermouth you use 1/2 sweet vermouth and 1/2 dry vermouth. There are lots of variations on the Manhattan: A Rob Roy, A Dry Manhattan, A Perfect Manhattan, A Brandy Manhattan, A Metropolitan, A Cuban Manhattan, a Tijuana Manhattan, and one of my favorites The Fourth Regiment! The possibilities are endless! 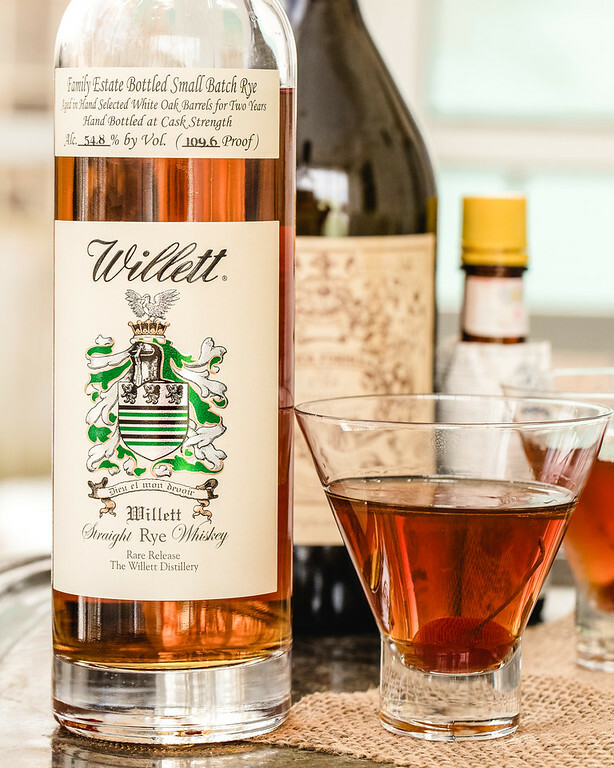 For our Manhattan, we chose Willet Straight Rye Whiskey. Who doesn’t love an easy 4 ingredient cocktail, especially when one of those ingredients is the garnish! Making a Classic Manhattan Cocktail is so easy! Fill a cocktail mixing glass halfway with ice and add rye whiskey (or bourbon or Canadian Whiskey), sweet vermouth, and a couple of dashes of Angostura Bitters. Stir. Strain into a chilled cocktails glass and garnish with a maraschino cherry. Add a little bit of fall flavor with this Maple Manhattan! 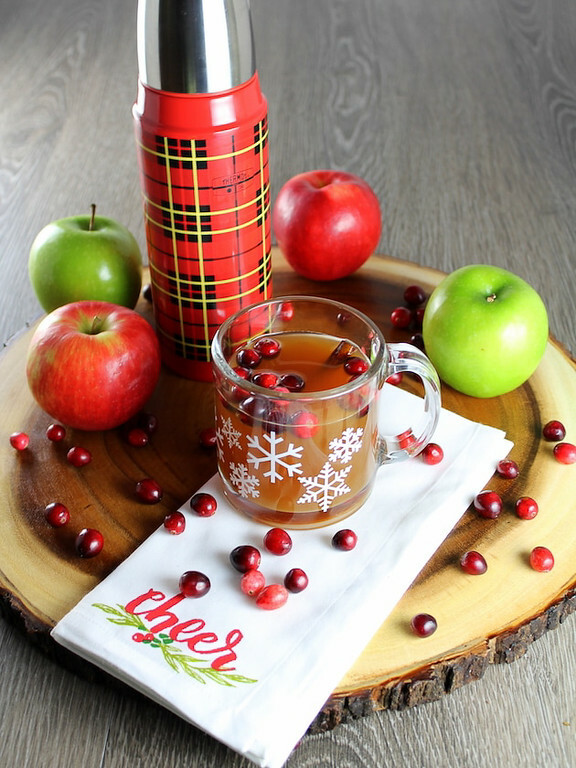 How about you work your way through these 15 Apple Cocktails to Make Right now! Perfect for parties! 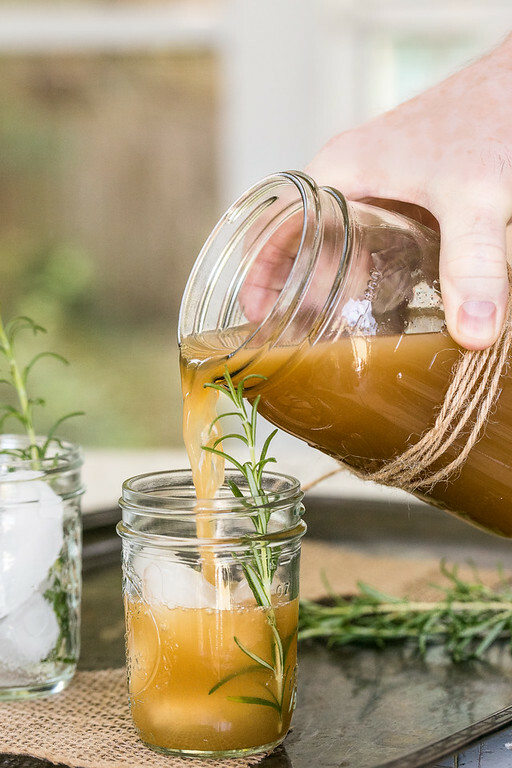 Everyone loves this Apple Rosemary Whiskey Cocktail! 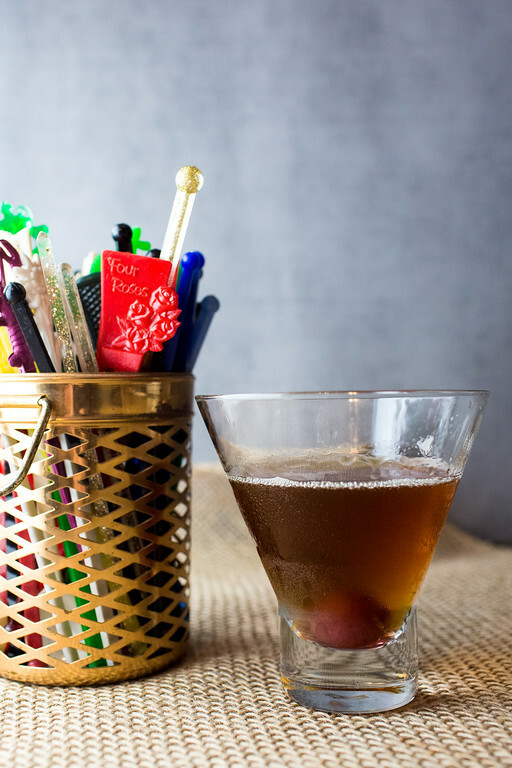 This Classic Manhattan Cocktail is a classic for a reason! So easy to make and so easy to sip! Fill a cocktail mixing glass halfway up with ice. Add whiskey, vermouth, and bitters. Stir to combine. While a rye whiskey is classic, you can also use Canadian whisky, bourbon, blended whiskey, and Tennessee Whiskey. 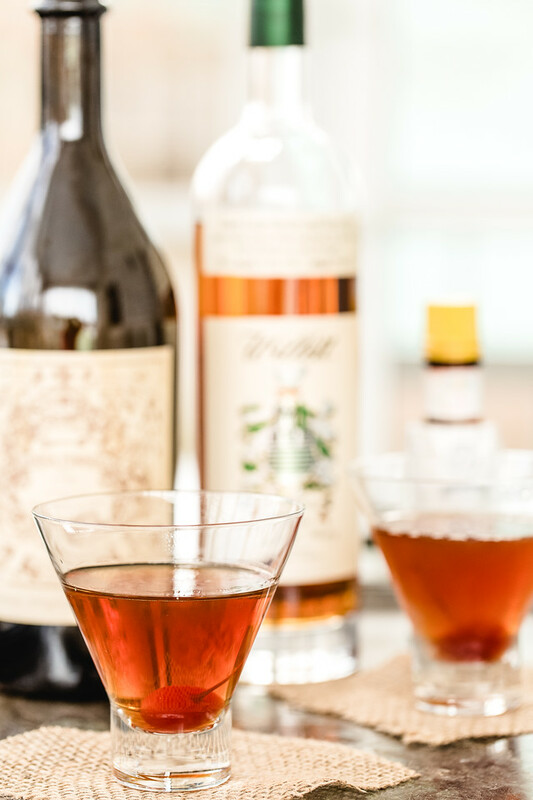 Use 1/2 ounce sweet vermouth and 1/2 ounce dry vermouth to make a Perfect Manhattan. I haven’t had a Manhattan in ages I’m a seasonal drinker so I guess that time is coming up. Love your glassware. Yes, it’s time to switch to fall cocktails! I love to get a Manhatten every once in awhile. It’s a break out drink for me… I”m usually a wine drinker. In the winter, on cold Sunday, with a fire going and a good book, this is my drink. I must add a cherry this year. This was my parents’ favorite cocktail. They drank these in the evening “cocktail hour” and made them for their bridge parties. During these parties, after drinking one or two, they switched to drinking iced tea. Their bridge opponents, who continued to drink Manhattans, could never figure out why my parents always won! We have laughed about this often! Thanks for reminding me of a sweet memory! What a great story!! I love it! A manhattan is one of my favorite drinks to order out. I’m just over the border of Kentucky so I usually have mine with bourbon. But all bourbon is whiskey, right? I’ll have to finally try making a manhattan at home thanks to your inspiration! Yes, definitely try making them at home – they are so easy! Great post! 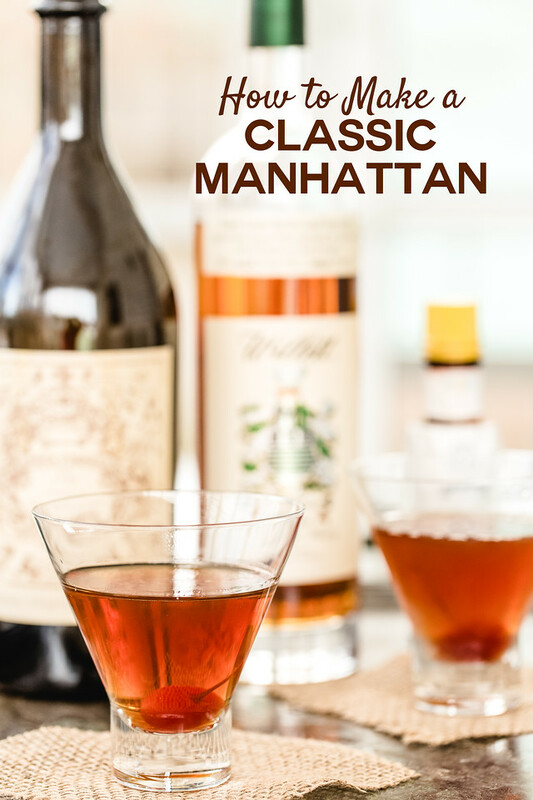 I’ve never made a classic manhattan at home so this is super helpful! Thanks for sharing. Just in time for the holidays! I love knowing how to make the classic drinks- it makes me feel like a real bartender- and the manhattan is a classic! Thanks for the recipe! I know a group who would love this classic. Thanks for a great recipe and simple instructions! It’s such a simple cocktail, but so great! It’s a classic for a reason!! So good!